LIMA, Peru (AP) — Peruvian troops captured on Sunday the wounded leader of a remnant of the once-powerful Shining Path rebel group, effectively dismantling a well-armed outlaw band that lived off the cocaine trade, President Ollanta Humala said. Humala, a former army lieutenant colonel, flew to the remote coca-growing Upper Huallaga Valley of central Peru to congratulate the police and soldiers who had snared the 50-year-old rebel, Comrade Artemio, and two of his confederates. Artemio, whose given name is Florindo “Jose” Flores, was later flown to Lima where doctors at a police hospital operated on him to remove two bullets from his torso, said Raul Sanchez, spokesman for the chief prosecutor’s office. Artemio also had shrapnel wounds in both hands, he said. As he arrived in Lima and was wheeled from a plane, journalists saw Artemio raise his right arm and shout something indiscernible. “The Shining Path is no longer a threat to the country. 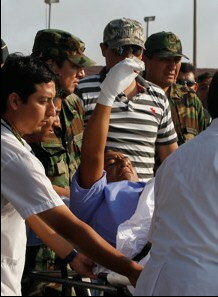 It’s capacity is limited,” Humala said from the counternarcotics base Artemio was initially airlifted. 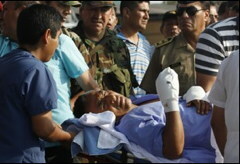 A photo released by the presidency showed him standing beside Artemio, both of the rebel’s hands bandaged along with his chest. Humala said that with the capture of Artemio and several of his top lieutenants in recent weeks the Upper Huallaga had been pacified, making agribusiness, cattle ranching and tourism now possible. The valley is currently the only region of Peru where U.S.-financed coca eradication is occurring. Analysts consider Artemio’s capture a crippling blow to a roughly 150-strong band that represented about half of what remains of the Shining Path, which killed thousands during the 1980s and 1990s. He was apprehended at 3 a.m., said Sanchez, near where he was wounded three days earlier under circumstances neither Humala nor other officials explained. 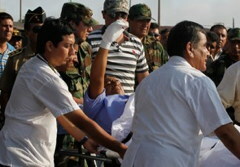 Defense Minister Alberto Otarola said Friday that Artemio was wounded in combat with government forces early Thursday in the village of Puerto Pizana. But local journalists have reported that at least one of his own men may have turned on him. The other remaining Shining Path faction, also involved in the drug trade, is centered further south in the valley of the Apurimac and Ene rivers. Humala said security forces would now focus efforts on fighting that group, which was blamed for an attack on a remote police station last Monday in which two police officers were wounded. 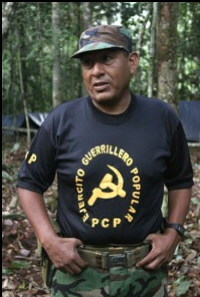 Humala expressed pride in announcing the capture of the guerrilla who was the Shining Path’s regional chief in the early 1990s when Humala commanded an army garrison in the Upper Huallaga. He said security forces had been “closely following” Artemio in recent weeks and had acted at an opportune moment when civilians wouldn’t be in harm’s way. The mayor of the La Polvora district encompassing the village, Nanci Zamora, told The Associated Press that Artemio was brought before dawn Thursday to an emergency medical technician in the nearby town of Santa Rosa de Mishoyo. She said that after he was treated subordinates took him down the Mishoyo river, a tributary of the Huallaga. It was not immediately clear how troops located him. The Shining Path largely collapsed after the 1992 capture of its leader, Abimael Guzman, who is serving a life term for waging a brutal war that slaughtered peasants and city-dwellers alike. Today, it is a tiny vestige of the movement that in its 1980s heyday controlled large swaths of the Peruvian countryside. In December, Artemio told visiting journalists that his cause was lost and he was seeking a truce with the government. The self-described Marxist said he wrote Humala twice but received no response. Previous Peruvian governments had also refused to negotiate a truce, he said. The chief prosecutor’s office said via Twitter that Artemio could face a life sentence for crimes including terrorism and drug trafficking. Peru is the world’s No. 2 producer after Colombia of coca, the basis for cocaine, although the U.S. Drug Enforcement Administration says it has now surpassed its Andean neighbor in potential cocaine production. DEA officials say that’s because comparatively little coca crop eradication occurs in Peru, where plantations tend to be more mature and higher-yieldling. Associated Press writer Frank Briceno contributed to this report.